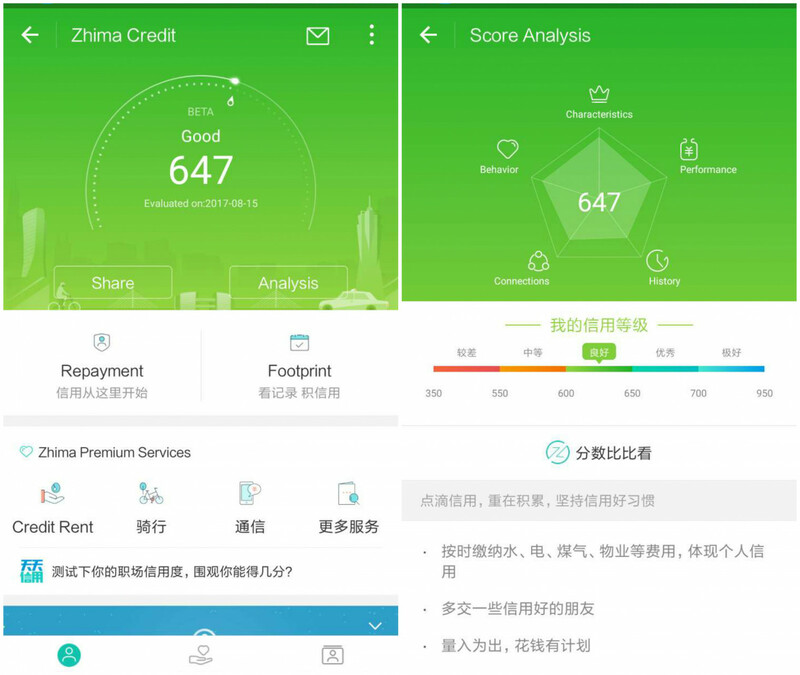 Screenshot of Sesame Credit on Alibaba’s Alipay app. But the fact that a private company is collecting so much different data has led to concerns that recently prompted China’s central bank to withdraw tech companies’ licenses for conducting social credit pilots. Some of the reasons behind the decision are the lack of consumer privacy protection, overreach of data collection, as well as conflict of interests, Ahmed explained. “My own thoughts on this are that the government probably didn’t expect that something like Sesame Credit would have hundreds of millions of users in just two years and be so deeply embedded in people’s lives,” said Ahmed. Subsequent media reports of hackers claiming they earned thousands of dollars by manipulating Sesame Credit scores (in Chinese) have further cemented fears over data leaks. And this isn’t the only case—according to a report from Caixin (paywall), China’s entire data industry is trading personal information in a way that causes systemic abuses of privacy. But neither the government’s decision to pull back on the pilot nor mounting concerns over data privacy has stopped Alibaba from moving forward with its social credit scheme. In fact, its biggest rival, Tencent, announced the launch of its own credit system in early August signaling that private social credit systems are alive and well. This shouldn’t surprise us. Society in the West has already accepted a fairly extensive social credit system for many decades, including private credit ratings, employee assessments which can be shared, customer cards and reward credit cards, Professor of Law and International Affairs at Penn State Law Larry Cata Backer told TechNode. While many reports have focused on how social scoring will affect individuals, a more interesting aspect might be its implications for doing business in China, including foreign companies. According to an analysis published by Mercator Insititute for China Studies (MERICS), China’s Social Credit System has the potential to become the most globally sophisticated and fine-tuned model for IT-backed and big data-enabled market regulation. 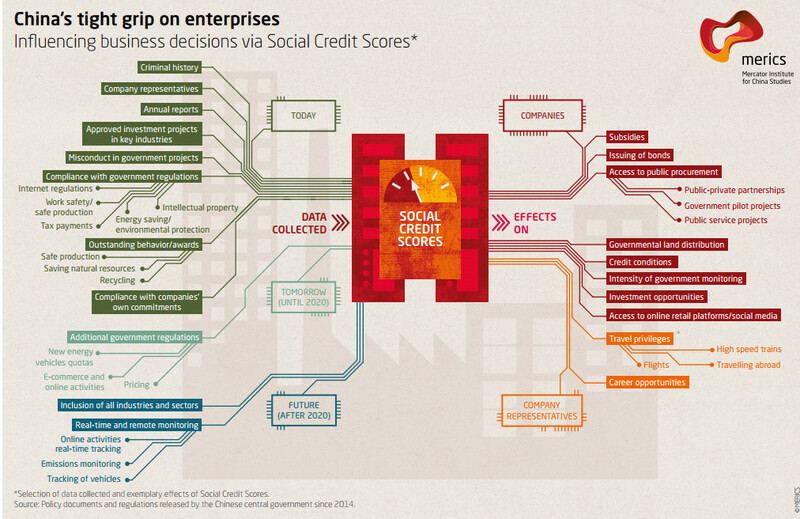 “Functionally speaking, the Chinese social credit system has a wider goal than the Western credit system. It also aims to standardize industries, especially professional industries, into the system,” Zhu Shaoming said. The MERICS report states that China is currently implementing a highly innovative approach to monitoring, rating, and regulating the behavior of market participants, including individuals, companies, and other institutions, such as NGOs, which will fall under the Social Credit System. The idea is to create a highly effective and adaptive economy capable of outperforming slower and more fragmented Western economies. At its heart: massive data collection. The data will be collected from multiple sources by the so-called “National Credit Information Sharing Platform” and used to generate ratings for each company. These scores will have an immediate impact on business opportunities for companies incentivizing them to self-restrict their behavior by following regulations and government industrial targets. A good example of this is real-time measuring of emission data for polluting industries which is already being piloted. But this is also where the first problems are visible. In April, media reported that one-third of manufacturers in northern China fabricated real-time pollution data in the government-installed monitoring systems. If left unchecked, data manipulation, as well as data hacking, could turn the heart of the Social Credit System into one of darkness. But even with transparent data, the AI algorithms that will eventually be used for calculating credit scores might remain opaque. Opposite of lacking oversight, another potential risk is too much state control over the economy that could reduce the capacity for autonomous business decisions or disruptive business models that fall out of the standard, the MERICS report notes. In order to avoid bad scores, companies might be pressured to comply with political targets even if it doesn’t make sense for them business-wise. For now, this is all just speculation. If implemented correctly, the system will have many positive effects on China’s market, including fewer lawbreakers and more transparency. It could also make China a leader in big data-based technologies and a role-model for other economies in the world. “In my opinion, social credit is already poised to become a dominant mode of managing behavior all over the world,” said Cata Backer, adding that the system would first have to be effectively implemented and transposed to other national cultures. As for the fear of IT authoritarianism and China’s poor track record in keeping its citizens’ data private, this question may be more connected with the love of secrecy for which the Chinese state is known for. This article was updated on August 23rd to correct the statement that users with low scores on Sesame Credit may affect receiving loans or refunds for online purchases. Sesame Credit currently does not have any punitive measures for users with low scores, nor does the Sesame Credit score affect receiving loans.